More news from over the border… Belfast based Hard Rockers Maverick have revealed the cover artwork, by Gerard Torbitt Art, for their upcoming ‘Quid Pro Quo’ album due out on Germany’s Massacre Records. The band are also in the process of making their first ever music video which will precede the albums release. 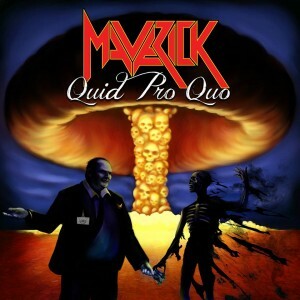 Maverick are also running a competition through their facebook page to win 10 copies of the new CD on it’s release. Simply ‘like’ and ‘share’ the picture of the album artwork directly from this (linked) post on the bands facebook page. Everyone who shares the cover from where it is originally uploaded on Sunday 27th April will be entered into a prize-draw (winners shall be picked on video!). The competition will run for 7 days and the winners will be revealed on Sunday 4th May!! !